For UN Peacekeeping Post, How Ladsous Replaced Bonnafont, Who Now Returns Favor Under Juppe, Alliot-Marie Role? UNITED NATIONS, September 10 -- The UN's Department of Peacekeeping Operations remains at partially headless in the midst of mounting scandals of sexual abuse in Haiti, and inaction in Sudan. After leading the top DPKO post empty for four weeks after the departure of Alain Le Roy, on September 2 the UN announced his replacement. It was not fellow Frenchman Jerome Bonnafont, who had bragged that he had the job to diplomats in India where he's been French Ambassador, and been congratulated by, among others, French politician Jean-Marie Bockel, click here for that. Rather it was the French Foreign Ministry's chief of staff Herve Ladsous, who headed the staff not only Alain Juppe but also his predecessor Michele Alliot-Marie, who resigned after being exposed receiving gifts from now deposed Tunisia dictator Ben Ali. 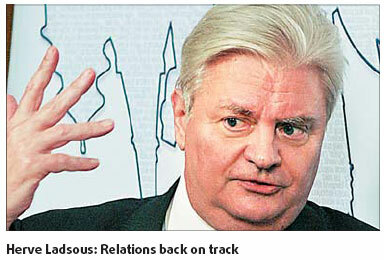 Ladsous' role in that is not yet clear, even as his statements in 2004 pushing for the ouster of elected president Jean-Bertrand Aristide come into focus in Haiti. Others of Ladsous statements are starting to be reviewed, as it appears the UN in their rush did not do. Meanwhile, tellingly, Bonnafont has been named to replace Ladsous as chief of staff to Alain Juppe. Well placed UN sources have informed Inner City Press how Bonnafont was passed over at the last minute for Ladsous. These sources say that UN Secretary General Ban Ki-moon likes his cabinet members even lower key than he is, like his Deputy, and Lynn Pascoe in the Department of Political Affairs. Bonnafont was viewed, ironically, as too energetic. His bragging about having the job, first reported by Inner City Press, was also not helpful. So, the sources say, Ban told the French to propose another candidate. Miffed, Ladsous was proffered as "the one," and was quickly given the post, without word reaching many in the French foreign service outside of Paris. Kofi Annan "gave" DPKO to France as part of being Secretary General. From Jean-Marie Guehenno the post went to Alain Le Roy and now to the third Frenchman in a row. It is noticeable that even after Ladsous was named, after the post was empty for a month, Ladsous has still not reported to work. He continued as chief of staff to Alain Juppe. And now Ladsous' replacement has been named. Who is it? Jerome Bonnafont, of course. Plus ca change, plus c'est la meme chose. Watch this site.